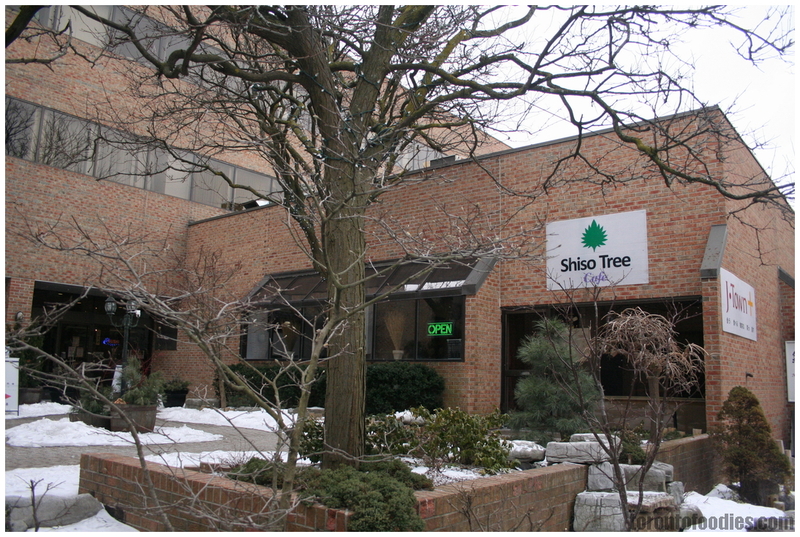 I’d seen the Shiso Tree Cafe a few years ago, next door to ramen restaurant Niwatei at J-Town, a small collection of Japanese shops and restaurants near Steeles & 404. 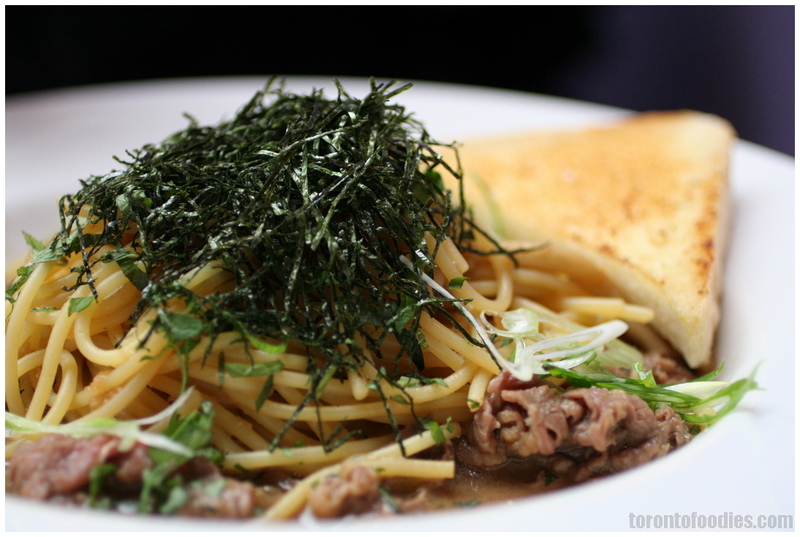 I found out over the past half year (via reviews from BlogTO, Amy’s Food Adventures, Food In The City TO) that they featured Japanese-style Italian food ~ i.e. Italian food localized for Japanese palates. I find these cultural interpretations interesting, especially when it evolves into an entire cuisine in itself, like Hakka-Indian food (Hakka Chinese food localized to Indian palates), or Hong Kong “Cha Chan Tang” Western Food (Hong Kong’s interpretation of Western cuisine). Mind you, I don’t share the same enthusiasm for “exotified” or higher-end asian fusion. It just feels a lot more forced/shoehorned, and a lot less organic, in terms of the development of the cuisine. I haven’t had Japanese-Italian before, and figured I should at least sample the cuisine to have a baseline for comparison when I go to Japan in a few weeks. The blog reviews already highlighted a bunch of must-haves, specifically the Nori Fries, Okonomiyaki Fries, and Black Sesame Creme Brulee. 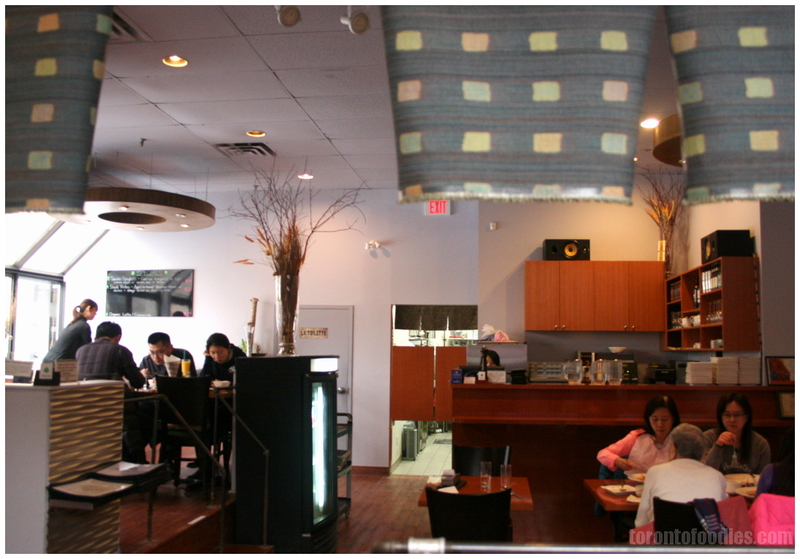 The layout is unusually elaborate for a suburban resto-cafe. There’s a private tatami room with a recessed floor under the table (horigotatsu-style seating). There are two areas that are elevated, each with a handful of tables. I suspect this improves the view on evenings where live bands are playing, as there was a drum set on the restaurant floor. There’s capacity for 8-10 tables of 4, amply spaced out. The menu is partition into Appetizers and Pastas, with Pasta further categorized as “Wafu”, Cream sauces, and Non-Cream sauces. “Wafu” (和風) translates to “Japanese-style”, and refers to the Japanese-style spaghetti dishes like Sukiyaki Beef Spaghetti, or Shoyu Mushroom Spaghetti. All pasta orders are accompanied by a small salad and garlic toast. 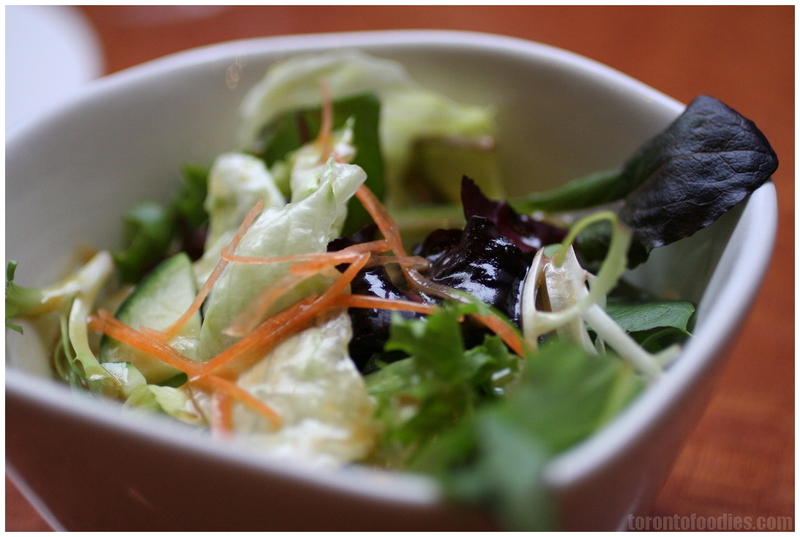 The salad is light, cool, crisp, drizzled with wafu dressing featuring soy sauce and sesame oil as its main components. The concept of raw cool greens with soy sauce was a very foreign combination, having been accustomed to either creamy or tart vinaigrettes, but it works. A welcome departure from the typical ginger-citrus-soy salad dressings of sushi restaurants around town. We ordered both the Okonomiyaki Fries ($8) and Nori Fries ($6), but we warned that it may be a lot of food. Fortunately, we scaled back and ordered just the Okonomiyaki Fries, as their warning was well-justified — it’s a very big plate of very crispy fries, drizzled with Japanese mayonnaise (tangy mayo, smoothed out with a bit of sweetness) and okonomiyaki/otakufu sauce (a mellow, sweeter teriyaki sauce with a mild tang & more dashi/umami). A confetti of nori (roasted seaweed) flakes, green onions, and dancing bonito flakes add both visual and flavour impact, but are never overpowering. A blend of sweet, salty, tangy, crispy, creamy, and several sources & varieties of umami, there are just so many flavours blending together. This dish really does taste like okonomiyaki, substituting fries for the original dish’s pancake. As much as I want to try the Nori Fries next time, it’s very hard to resist ordering this dish again. The Sukiyaki Beef Pasta ($15) was perfectly firm, al dente spaghetti, dressed in a sweet soy sukiyaki sauce, flavoured to add just enough saltiness to the pasta. The copious nori flakes completely overhaul the dish, turning “sweet soy sauce pasta” into something far more complex, adding an earthy, moss-like aroma. A sparse few chiffonades of shiso leaf (“Japanese mint”) burst with refreshing floral notes, but are far and few in between bites as to not be overpowering. The beef and mushroom were fine, but neither added nor took away from the dish, aside from beef slices being the meat traditionally associated with sukiyaki. 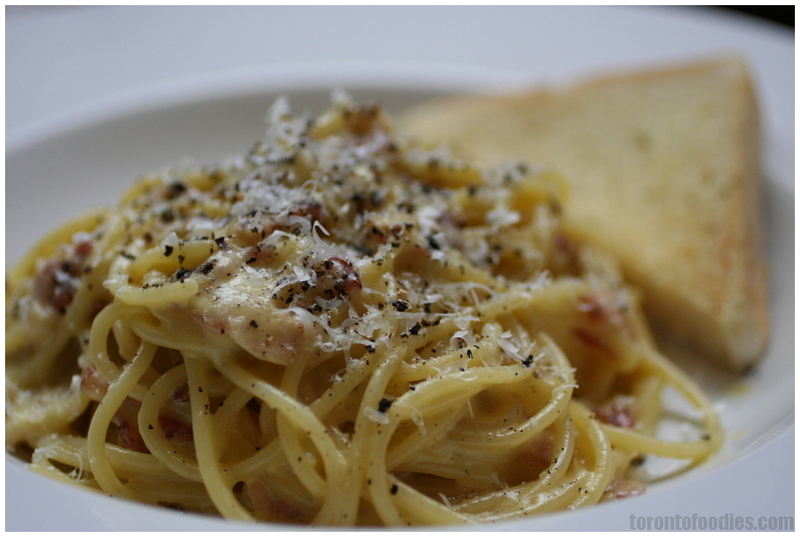 The Carbonara Pasta ($11) was competent, with generous portions of bacon and fresh cracked pepper. You could taste the egg yolk binding the carbonara sauce, which clung firm to the firm, al dente spaghetti. The cheese (if any) wasn’t particularly intense, nor could I identify the binding oil (didn’t taste butter nor the milkiness of cream). Seeing as this was not a “Wafu” dish, but rather, their proper attempt at an Italian dish, there was nothing wrong with it. I’m glad, then, that they were able to execute it properly, though nothing made me say “wow”. I think allowing the customer to mix the yolk may have given the dish some more pizazz. Both pasta dishes came with a wedge of garlic toast. The toasts were thick-cut, and almost had a pan-fried quality to their crispness (though I’d wager they were over-baked). The crispness went a third of the way into the bread on both sides, with a fluffy, light third in the center. 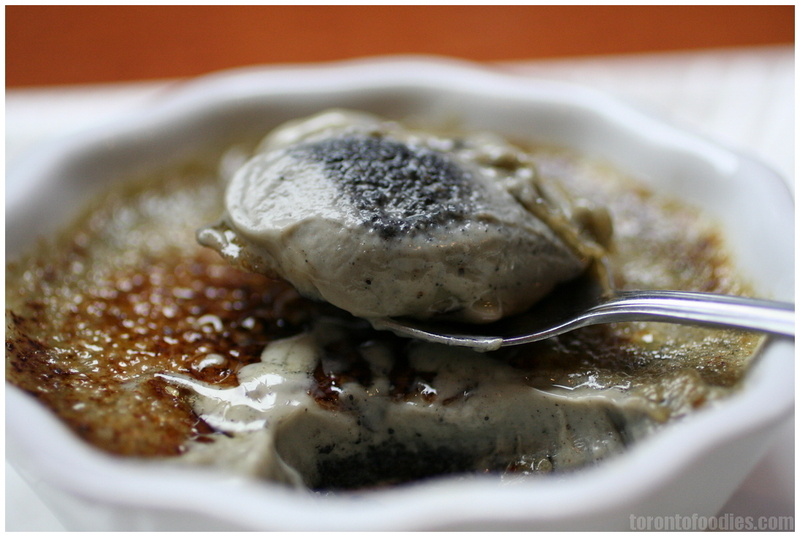 Every review was unanimous about the Black Sesame Creme Brulee ($7). This was yet another fantastic dish in balanced flavours. The thin layer burnt sugar crackled away to expose a layer of black sesame creme, with a thin layer of black sesame sunk to the bottom. The creme was smooth, not too sweet, served lightly chilled. The burnt sugar with its contrasting bitterness and sweetness, was expected. The black sesame layer, with its nuttiness and slight bitterness, complemented the burnt sugar extremely well. The pair of ingredients, smoothly bound and rounded out by the creme, was a harmonious exercise in a gentle, just-sweet-enough dessert. I’ve heard that the Japanese-Italian food in Japan far exceeds that of Toronto, and I’m very excited. I may later decide that, in comparison Shiso Tree doesn’t compare, but until then, I’ll happily enjoy the Okonomiyaki Fries and Black Sesame Creme Brulee here. 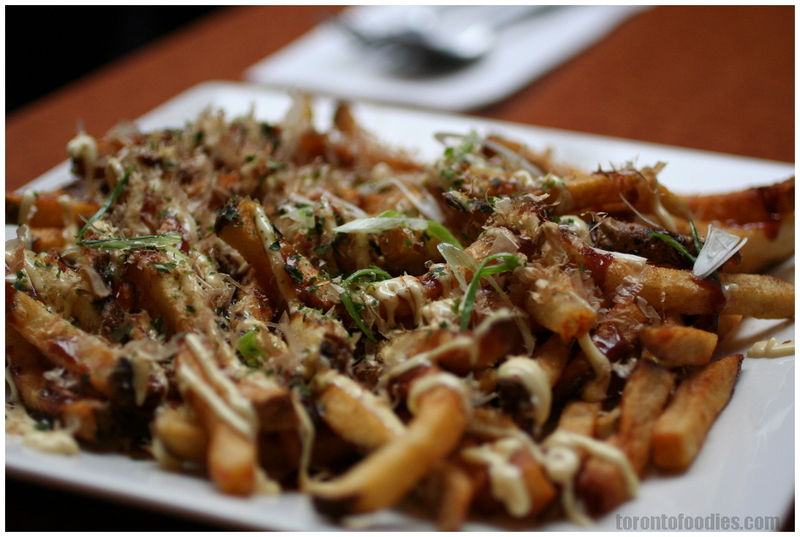 I had the Okonomiyaki Fries last time I was there and i hated it. The fries were OVERcooked and it was sooo dry, blah! I can’t rmb what pasta I ordered but it was way too salty for my taste =( I wont be going back here again. Aww noes.. Sorry to hear that Jenny! Tummy space is too valuable to waste on 2nd chances. Hmm I’m wondering if there’s any place that ended up better on the second try, and I can’t think of a single one right now.